CHIMA S.A. solvent storage facilities took fire and caused the spill up of almost all solvents which were stored in the plant. 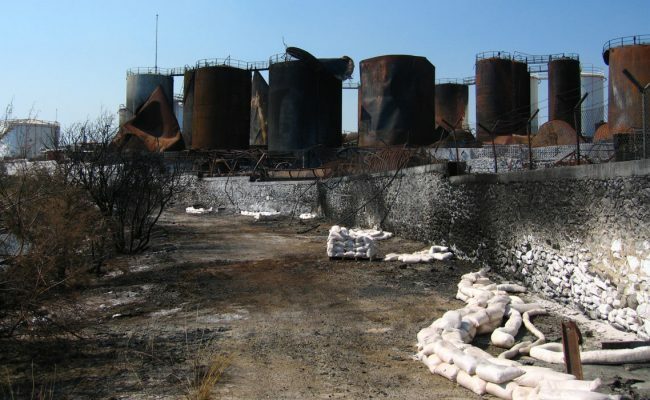 Several tanks went off and some exploded causing contamination outside the boundaries of the plant, including the shoreline and sea. EPE responded to the spill from both sea and ground level. Spill response operations commenced within a couple of hours from the event. Soil, water and groundwater samples were collected and analyzed for the classification of the waste and the mapping of contamination. Hot spots were identified and remediated with priority. An environmental remediation proposal was prepared and site remediation actions commenced soon after the event. All tanks and other structures were demolished to ground level and the site was rehabilitated to its former condition. Follow-up monitoring was being conducted for several months after completion of rehabilitation works.